Mental health disorders are increasingly common, and depression is the most predominant type of mental health disorder worldwide, closely followed by anxiety. In fact, depression affects around 25% of people in the UK. Many factors have been linked to the development of depression and research is now showing that inflammation may play a key role. In this article, we examine the evidence behind the inflammatory side of depression. Depressed? Or just feeling low? Mood fluctuations are relatively normal and most of us will experience them from time to time. It is unrealistic to expect to be happy all of the time. If symptoms of low mood persist for longer than 2 weeks and affect day to day living, then a diagnosis of depression may be made. There is no test for depression and symptoms are assessed against criteria laid out by NICE. Depression affects all age groups and ethnicities but there is a very distinct difference when it comes to gender. Women are twice as likely to experience depression compared to men (1). There are many degrees to depression and some people experience mild depression whilst others are affected more severely. Major depressive disorder describes a severe episode of depression and if symptoms of depression span over 2 or more years it may be termed chronic. There are different types of depression that occur, and these include postnatal depression, typically within the first 4 weeks after having a baby and SAD which occurs seasonally in autumn and winter. Bipolar and atypical depression are less common. It is commonly thought that the predominant symptoms associated with depression is a persistent low mood, however, depression can bring many psychological and also some physical symptoms. Depression is often seen in conjunction with other conditions and it can occur alongside stroke, cardiovascular disease, fibromyalgia, chronic fatigue syndrome, gut disorders and chronic pain (2). Depression is a complex condition that that seems to have many factors involved in its development. 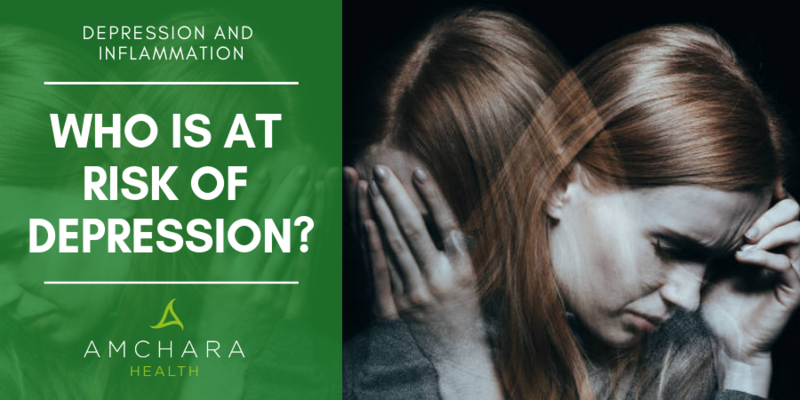 Like many health conditions, the involvement of one or more of these factors may be responsible for the development of depression, rather than it being due to one factor only. Mood is under the influence of many chemical substances called neurotransmitters. These include serotonin, dopamine and noradrenaline and together they help to send messages between nerve cells. Around 50 years ago it was thought that the main cause of depression was due to an imbalance of neurotransmitters, this monoamine hypothesis became the basis for commonly prescribed medications to treat depression. Imbalances in neurotransmitters are influenced by many factors and it is vital to identify what is playing a role. More recently it has been shown that the genes we inherit from our parents play a role in the development of depression. This may explain why there is a strong family link to depression. Although many genes have been shown to affect enzymes that have an influence on the balance and excretion of neurotransmitters there does not seem to be one single gene that is solely responsible for the development of depression. It is thought that a combination of several factors may increase the expression of particular genes, much like turning a light switch on, to create the right environment for depression to develop (3). Interestingly, researchers have found that genetic factors accounted for 42% of depressions in women and only 29% in men (4). This may be one of the reasons why women have a higher incidence of depression. Everything in the body is connected and imbalances in a variety of hormones has been linked to depression. One very common symptom of low thyroid function is depression and increased stress, leading to an increase in cortisol, also increases the chances of depression. The balance between oestrogen and progesterone may also affect mood and times of fluctuations in these hormones can lead to a bout of depression. For example, following the birth of a child, during the monthly menstrual cycle and during the menopause. This may further explain why women are more affected by depression than men. Within the gut there are around 40 trillion bacteria. This complex eco-system we carry in our gut is called the microbiome and is now known to have some profound effects on health. For example, it supports the gut lining keeping it healthy, plays a role in the immune system and even produces some vitamins and neurotransmitters. The microbiome also communicates with the brain via the vagus nerve, this means that the balance of gut bacteria may actually influence mental health. One interesting study showed that transplanting gut bacteria from a depressed person to a rat with a sterile gut (no bacteria) actually induced depressive like behaviour in the rats. The incidence of depression in functional gut disorders, like IBS, may be as high as 90% (6). A variety of vitamins, minerals and amino acids are involved in the balance of neurotransmitters and mood and a deficiency of certain nutrient may affect the production or breakdown of important mood chemicals. For example, vitamin B12 and folate are essential for a cycle that involves the synthesis of neurotransmitters like serotonin and dopamine and low levels of these nutrients are implicated in depression (7). Dietary tryptophan is important as it is used to make serotonin, tryptophan is found in protein rich foods and a very low protein diet may reduce tryptophan intake. A diet high in sugar, processed foods, high fat dairy, fried foods and refined cereals has also been linked to the development of depression. Over the last decade, the topic of inflammation in depression has gained much interest. Many research papers have shown that there is a strong inflammatory side to depression. Experts believe that depression is not an inflammatory condition itself but there is no denying that inflammation plays a role. 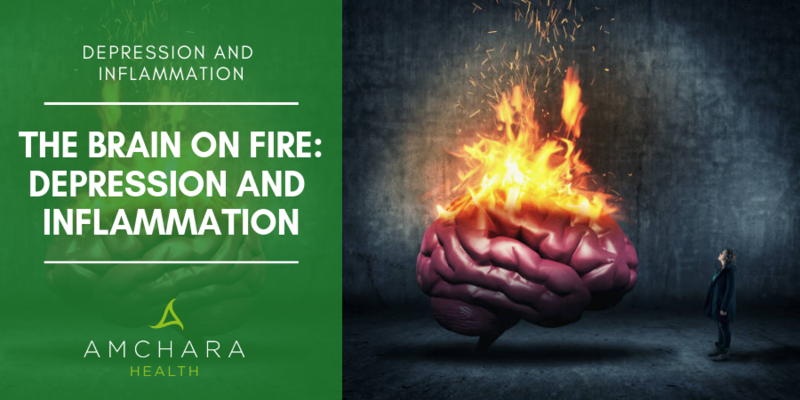 When we think of inflammation we think of pain, heat, redness and swelling, this is true of a localised response such as to an injury experienced during exercise, however, inflammation may be systemic and affect the whole body, including the mind. Inflammation is a natural reaction to injury or infection and is under the control of the immune system. It involves many cells, tissues, proteins and other molecules that work to get rid of the problem, clear out any dead tissue and toxins and aid in repair. At the onset of an injury or infection, the immune system calls upon messengers like cytokines to manage the inflammatory response. There are many types of cytokines all with their own specific functions and some may be pro-inflammatory – increasing inflammation and some may be anti-inflammatory – dampening inflammation. Inflammation may be monitored through blood tests for C-reactive protein, which rises during bouts of inflammation, and also the cytokines themselves. The exact mechanism in which these cytokines affect mood patterns isn’t entirely clear, however, there is evidence to show that they can increase the activity of an enzyme that influences the breakdown of tryptophan. High levels of pro-inflammatory cytokines can, in fact, reduce the amount of serotonin synthesised from tryptophan and send it down a potentially neurotoxic pathway (12-13). This reduction in serotonin availability is thought to impact mood. 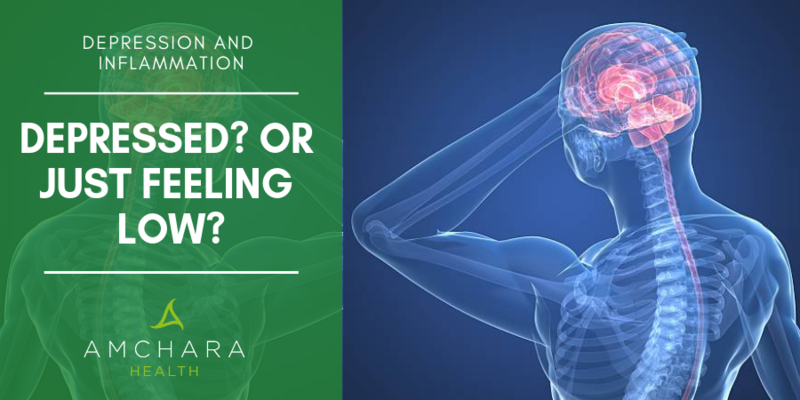 Where exactly the inflammation is coming from in depression isn’t always clear and there may be several factors involved. Sleep disruption is common in mental health disorders and even modest sleep restriction (from eight to six hours per night) causes immune disruption and increased levels of pro-inflammatory cytokines (14). Interrupted sleep, alongside other factors, may make the development of depression more likely or indeed exacerbate the condition. Stress is a common trigger for depression and the increase in stress hormones, like cortisol, over a period of time can raise pro-inflammatory cytokines which not only fuel inflammation but further stimulate the stress response and affect the conversion of tryptophan to serotonin (15). During a bout of depression, it can be hard to make the right food choices and there may be cravings for carbohydrates and sweet foods, this is the body’s way of trying to increase serotonin levels. Carbohydrates stimulate insulin release which influences amino acid balance and allows more tryptophan to be available for conversion to serotonin. Despite this, a diet that is high in sugars, saturated fats and processed foods and low in fruit, vegetables and oily fish is highly inflammatory and may be a contributing factor in depression. Being physically active is well known to promote good health and a sedentary lifestyle also gives an increase in inflammation (16). Breaking sedentary behaviour with regular activity and exercise can lower inflammation (17). Being overweight or obese also raises inflammation due to the increase in fat cells. Fat cells are a rich source of inflammatory factors and an increase in body fat is associated with the development of depression. This relationship goes both ways as depression is associated with an increase in body weight. Researchers are becoming increasingly interested in this area and it seems that many think that it is the increase in inflammation in obesity that leads to the predisposition to other conditions with an inflammatory nature such as type 2 diabetes and cardiovascular disease (18,19). The health of the gut lining has also been shown to affect levels of inflammation. The gut lining is a natural barrier preventing the entry of foreign particles, undigested foods and bacteria into the blood. When there is damage to the lining, the cells that are usually packed tightly together can become ‘leaky’. Once the leaky gut (also called intestinal permeability) lets foreign particles into the blood stream the immune system responds as it should do and there is a rise in inflammation. Patients with clinical depression have been shown to have an increase in antibodies to bacteria that are usually found within the gut, this indicates these bacteria have passed through the gut lining (20). Food intolerances and allergies may also trigger an inflammatory response as the offending foods pass through the leaky gut. One of the most common food substances linked to an increase in inflammation is gluten from wheat and other cereals. There is a high incidence of depression in coeliac disease, a condition whereby there is an immune response to gluten. Sensitivity to gluten is not limited to coeliac disease and non-coeliac gluten sensitivity is actually more common than coeliac disease itself and also shows a link to mental health issues. The gut bacteria have such a close relationship with the brain and neurotransmitters that it makes sense that dysbiosis, a situation where there is disruption to the types of organisms in the gut or the numbers, may affect mood. The microbiome may also influence the immune inflammatory response and disruption to the balance may negatively affect levels of inflammation. Nutritional alterations can have a significant impact on mood and many studies have shown that the Mediterranean diet, rich in fruits, nuts, vegetables, legumes, olive oil, oily fish, and low in meat and dairy, is one of the most supportive diets for mental health and also has anti-inflammatory properties. Making changes to what you eat may be difficult in depression, starting slowly and making changes one at a time may be more manageable. 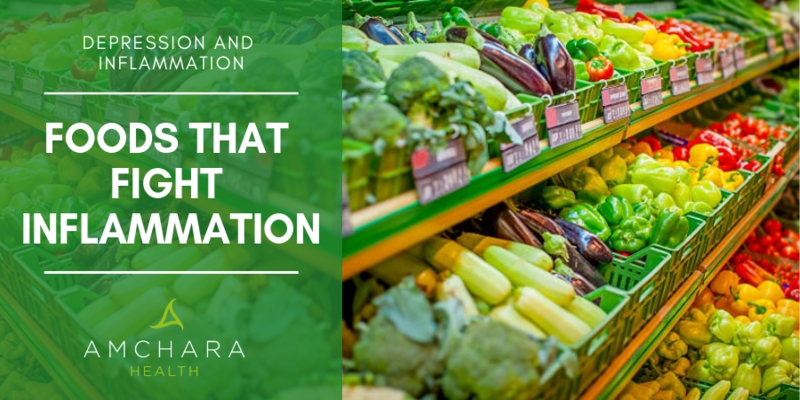 Fruits and vegetables possess a vast array of vitamins, minerals and plant compounds that have the ability to moderate the immune inflammatory response. Increase your intake to 8-10 portions a day, ensure half your plate at lunch and dinner is made up of vegetables and get as much variety and colours as possible. A rainbow food chart can be a useful way to track your intake. Particularly good choices include dark green leafy vegetables, dark berries and cherries, apples, onions and parsley. Fresh pressed vegetable juices can be a great way to increase anti-inflammatory compounds. Oily fish such as mackerel, herring, sardines, pilchards, trout and salmon all contain the essential omega 3 fatty acids. The omega 3 fatty acids are used in the body to make natural anti-inflammatory molecules that curb inflammation. Aim to eat 2-3 portions a week. A high quality, high strength fish oil supplement may further increase levels of anti-inflammatory omega 3’s. Use turmeric in cooking, it has strong anti-inflammatory properties and has been linked to lowering depression. Olive oil, a vital component of the Mediterranean diet, also shown benefits for inflammation and mood. Aim to keep sugar low, or eliminate completely, be aware of hidden sugars in foods and try not to replace table sugar with natural alternatives like honey, brown rice syrup, molasses and coconut palm sugar as they still have an impact similar to table sugar. Alcohol is a simple sugar and may imbalance neurotransmitters and so is best avoided or kept low. However, a glass or two of red wine a week does show favourable effects as part of the Mediterranean diet. Where possible avoid pre-packaged, processed foods as they are generally low in nutrients, have hidden sugars, salts and damaging fats. Home cooked food has a better nutritional profile and ensures you get the most out of what you are eating. Be aware of grains, particularly gluten containing grains like wheat, spelt, rye and barley, they may be contributing to levels of inflammation. Try not to replace these grains with gluten free varieties as many gluten free products are highly processed. Avoid refined carbohydrates found in breakfast cereals, breads, cakes, biscuits and pastries. Red meat and dairy may also influence inflammation as they contain substances that may alter the essential fat balance and therefore inflammation. It may be useful to monitor your beef, lamb, pork and dairy intake and opt for organic grass-fed meat which has more of the anti-inflammatory omega 3 fats. Avoid charred, fried foods and those containing trans fatty acids, these directly influence inflammation and generally are low in beneficial nutrients. Good cooking methods include steam frying, slow roasting, poaching or baking. Keeping a food and symptom diary can be a useful way to see if you are reacting to specific foods. Food intolerance tests are available and can test for intolerances to around 200 different foods. A qualified and experienced practitioner can guide you on these tests and also help you to interpret the result. Keeping your gut bacteria happy is paramount for good health and they thrive on specific foods. These are indigestible fibres such as inulin, fructooligosaccharides (FOS) and pectin and can be found in foods like garlic, leeks, onions, Jerusalem artichokes, asparagus, chicory root, bananas, apple, peach and carrots. Fermented foods contain their own natural balance of bacteria and can support the microbiome. Traditional foods like kefir, kombucha, kimchi, sauerkraut, kvass, apple cider vinegar, tempeh, miso and natto are all fermented. A stool test analysing the levels and types of bacteria in the gut can be beneficial to highlight specific species that may need repopulating with probiotic supplements, or whether there are pathogenic organisms that need eliminating. Investigating the health of the gut lining through functional medicine tests for the presence of leaky gut can help you to gain an accurate picture of your current health status. Tests are available as part of a comprehensive and detailed consultation. Book here. Finding your own personal ways to manage stress is essential. Stress is all around us tackling stress through making small bitesize changes to your day to day life is a good place to start. Finding your particular stress triggers and what works for you may take a while, but it is worth persevering. Prioritise ‘to do ‘ lists and only have 3 items to work on per day, learn to say ‘no’ – you don’t have to agree to do everything, take time out for yourself every day and delegate tasks to others. Calm the body and mind through gentle walks, meditation, visualisation, yoga, tai chi, arts and crafts or rhythmic breathing techniques. Aiming to get at least 8 hours of sleep a night may be easier said than done but setting a good bedtime routine – every night – and sticking to it is a vital step to good sleep. The body runs on a cycle of around 24 hours, this cycle is called the circadian rhythm, and disruptions to this cycle significantly impairs sleep. The circadian rhythm can be disrupted by staying up too late, getting up too early, not getting enough daylight in the mornings and using electrical devices late at night. Set up a routine where no smartphones, laptops, computers, TVs or eBook readers are used at least 2 hours before bed, have a relaxing bath with essential oils like lavender, meditate, listen to relaxing music and get in bed before 10pm. Set your alarm for the same time every morning and ensure you get some good natural light throughout the day. This also exposes your skin to sunlight which stimulates the production of vitamin D, a vitamin that is now known to have anti-inflammatory and immune functions. It may take a while to reset your circadian clock but it is worth it. You don’t have to join a gym or start doing high intensity interval training straight away, just be more mobile - walk more, take the stairs, get up out of the chair, do the gardening, do a few star jumps whilst waiting for the kettle to boil. In the long term aim for cardiovascular exercise at least 3 times a week for 30 minutes of more, if you don’t have this time to spare then maybe high intensity interval training is worth considering. Resistance exercise is just as important and try to lift hand weights, or use body resistance, twice a week. Addressing what type of foods you are eating and making some lifestyle alterations are likely to have the positive benefit of weight loss. Keeping an eye on body weight and aiming to keep an optimal body weight helps to reduce fat cells that contain inflammatory factors. A food diary often comes in useful as you can track your food intake and calories. Depression is a condition that involves many factors and it is clear that inflammation may be playing a large role. Tackling inflammation and moving towards a more anti-inflammatory lifestyle may significantly improve mental health. Taking things one step at a time may make the transition more manageable and a personalised consultation with a 360 o health practitioner can be useful to guide you on where to start. Book now for your complimentary consultation. We believe that sharing knowledge and experience is an important part of achieving 360o optimal health and would love to hear your views and experiences. Tell us where you started, what has helped you and what you found useful about this article.